This evening I had a smoky commute. 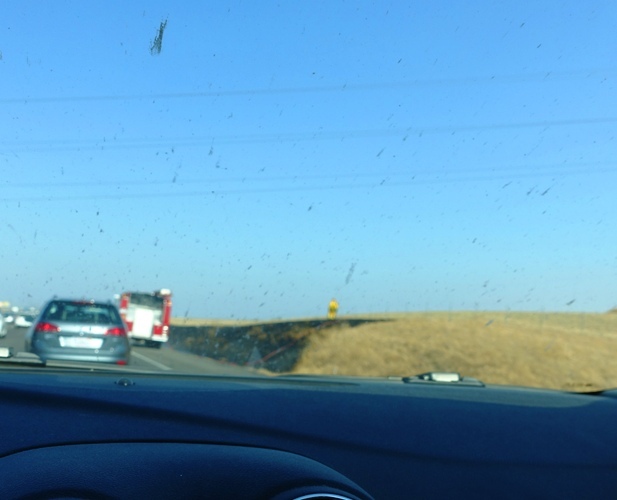 Not for the whole commute, but for a small stretch there was fire along the road. My commute had been going well when all of a sudden the estimated arrival time on my traffic app started getting later and later and traffic began slowing as I approached the 205 split. Just after I made it past the split a fire engine came by on the shoulder. By the time I made it to where the fire was the crew was out helping put out the fire and cool the hot spots. I had luckily turned on my air conditioner so that I was recycling air instead of pulling in fresh air. Despite this I was still getting a good dose of smoke and particulates. It was good that I was not driving through when the fire was going strong. Burnt grass is one of the worst things for me when it comes to allergies and by the time I made it home allergies had kicked in and I was not feeling too well. I was soon asleep on the couch and luckily most of the allergens worked out of my system during about an hour of sleep. However, they will be lingering in the air as I pass by tomorrow so I must remember to put on the air in the morning. Here another crew is spraying water on the burnt area to make sure that there are no flare ups after they are gone. In this picture there is still a small fire burning. I am sure they will get to it but it was putting off a lot of smoke and was where the worst air quality was. But, this is sort of what a commute is like. It is sometimes just a blur. I am now feeling much better, especially after a nice long walk in much cooler weather than what we have had in the past couple of weeks. 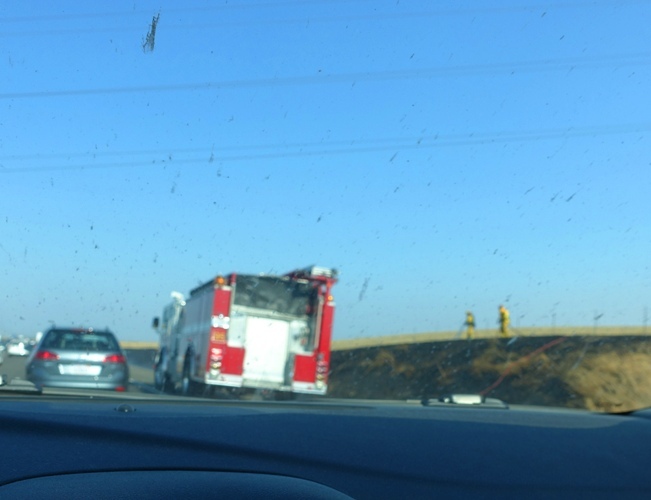 This entry was posted in California, Travel and tagged burnt grass, Commute, Fire, fire trucks, I-205, smoke, smoky air, Tracy California. Bookmark the permalink.